Royal Exhibition Building 9 Nicholson St, Carlton, , VIC, Australia. Register Online for your FREE ticket at the door. Otherwise tickets are $15 on the door. 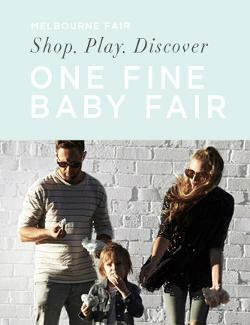 The annual One Fine Baby event returns to Melbourne at The Royal Exhibition Building, 9th - 11th September 2016. Recognised as Australia's premier retail destination for design-led family and lifestyle products, the exhibition welcomes an outstanding, curated line-up of over 100 carefully-selected brands (including Joolz, Stuck On You, Dyson, ChiKhi, Bella Buttercup and many new designers) in baby and child related industries under the one roof. Supported by the highest calibre of globally recognised speakers and brand visionaries, One Fine Baby sets to provide you with an exclusive insider's look into the world of retail and design, offering a hub of design activity and a place to hunt for the latest trends, connect with Australia's most coveted brands and come up-close-and-personal with design and celebrity sweethearts within an intimate shopping environment. One Fine Baby is a fun family day full of delicious food and children's entertainment. Shop beautiful products from over 80 of Australia best children's retailers while your kids enjoy the Ben & Holly's little kingdom show. Register every family member here for your FREE entry on the door. Whether you're planning for the arrival of your little one or here to have a great day out with entertainment like the Ben and Holly Stage show, you're in for an amazing day out. Tickets are available on the door for $15, if you do not register before Friday 12 Midnight. As a VIP ticket holder you will be greeted by a glass of champagne on arrival followed by 1.5hrs of exclusive access to OFB stall holders to shop before being seated for the inspiring guest panel. One Fine Baby's VIP night offers ticket holders exclusive access to guest panel speakers including Carrie Bickmore, Natalie Bassingthwaighte, Jules Sebastian, Kate Ritchie, Bec Douros and Nadia Bartel. Each will tell their personal tales and triumphs in an intimate setting designed to inspire us to make the best version of ourselves. These interviews will all be set to inspire you in areas of style, health, beauty, interiors whilst juggling work and children and having one amazing crack at life. PLEASE NOTE: This is an adults only event, ticket holders must be over 18+ to enter. Newborn babies under 10 weeks are welcome to come along with you. An afternoon with Tizzie Hall - sleep consultant & Author of 'Save our Sleep' will commence once the doors close to on the Saturday afternoon. This will give new parents and parents with children who are having sleep issues to hear from the sleep whisperer herself. Tizzie Hall has been working with children for many years and boasts a long list of relieved parents who have been helped with customised baby sleep solutions. The afternoon will consist of a 1hr workshop and a 1hr Q&A and the opportunity to get your Save our Sleep book signed by Tizzie. Save Our Sleep® believe it's every child's right to receive comfort, a parent's right to demonstrate love, and everyone's right to a full night of sleep. Do you have to rock your baby to sleep every night? Is your baby sleeping all night but up at the crack of dawn? Is your baby sleeping on his or her tummy and jammed up against the side of the cot? Does your toddler refuse to stay in his or her own bed? Is the idea of using "cry it out" or "controlled crying" just too painful for you to consider? What bedding should I use for my baby? What foods should my toddler eat? When should I start potty training my toddler? Is your child constantly testing the boundaries and you are not sure how to discipline them? If any of the above relate to you, you're in the right place so welcome to Save Our Sleep®.